Decades later, many of the consequences (both intended and unintended) of the Great Society era continue to be debated. More fundamental to the debate on those specific issues is a debate about the nature of rights themselves. Do they come from God and/or nature, or do they come from government? On one side of these debates are those people who believe that rights come from God and/or nature. Because inalienable rights are natural rights, we are all born with them. Nobody - government or otherwise - has to provide us with anything for us to have those rights. We need government though, to ensure our security in these rights which would be vulnerable to attack from others in a “state of nature.” We are born with the capacity and the right to believe, to speak, to develop and exercise our consciences. Those on this side of the debate would likely support laws that limit government to protecting the natural rights to life, liberty, and property. Though they support state and local governments providing education, they would be skeptical of federal involvement in public schools. And though they might favor state-based welfare programs and be personally charitable, they would not support the national government’s role in redistributing wealth. They might support a federal safety net for the poor, but not middle-class entitlements. ​On one side of these debates are those people who believe that rights come from God and/or nature. Because inalienable rights are natural rights, we are all born with them. Nobody - government or otherwise - has to provide us with anything for us to have those rights. We need government though, to ensure our security in these rights which would be vulnerable to attack from others in a “state of nature.” We are born with the capacity and the right to believe, to speak, to develop and exercise our consciences. Those on this side of the debate would likely support laws that limit government to protecting the natural rights to life, liberty, and property. Though they support state and local governments providing education, they would be skeptical of federal involvement in public schools. And though they might favor state-based welfare programs and be personally charitable, they would not support the national government’s role in redistributing wealth. They might support a federal safety net for the poor, but not middle-class entitlements. Government should provide us with security in our equal natural rights through just laws and consistent enforcement of them. Equal rights make for inequality because people with different capacities exercise them differently. So government makes possible the various inequalities that justice requires. Therefore, those who perform better are compensated better. On the other side of the debate are progressive liberals who believe that natural and inalienable rights are not enough for everyone to reach their full potential. They believe that rights include a basic standard of living and the means to thrive on a level playing field. They believe it would be possible for government to provide these things, and that it should have the power to try. They would likely support the national government requiring employers to pay a minimum wage, access to education paid for by the public, and affordable health insurance paid for by the public as rights, even if it meant that government could take from some in order to give to others. This positive view of rights holds that natural and inalienable rights are not enough for everyone to reach their full potential. Therefore, government has the responsibility not only to protect our natural rights, but also to provide us with certain goods and services, such as education, healthcare, law enforcement, military defense. Without this help some people would not be able to exercise their rights “meaningfully.” Therefore positive rights in practice come at the expense of rights in the negative sense: greater restrictions on liberty and higher taxes. The controversy over the Affordable Care Act (ACA) is a modern example of this debate. The ACA has so far been one of the most divisive pieces of federal legislation in the history of the United States. Debate about it often centers on the law’s requirement that all people buy a certain product (health insurance) whether they want it or not, or pay a penalty. In response to a constitutional challenge to the law’s individual mandate, the Supreme Court declared that the fines imposed by the law amounted to a “tax” and were therefore constitutional. Significantly, though, the Court held that the Commerce Clause did not give the national government the power to force citizens to buy a certain product. 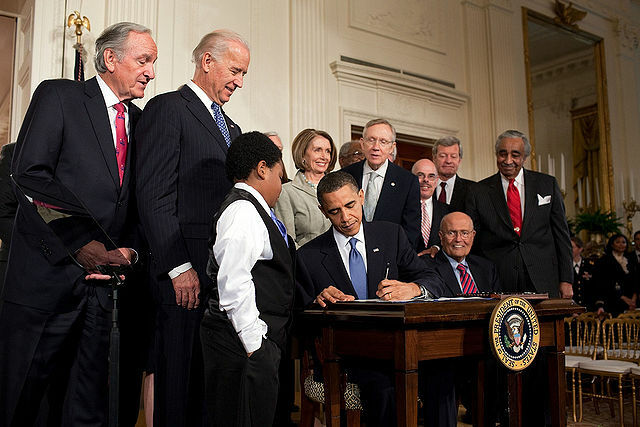 President Barack Obama signs the Affordable Care Act (2010), while his congressional allies look on. Another doubtful aspect of the ACA from the conservative standpoint depends on the nature of rights. This controversial provision is the ACA’s requirement that companies provide insurance that covers birth control with no co-payments - including drugs that prevent the implantation of a fertilized egg, which Catholics consider to be abortion - and sterilization. Catholics and some Protestants see these practices as morally wrong. But the law requires them to provide insurance options that cover these services even if they run counter to their religious beliefs. While the law exempts churches, it contains no exemption for religious organizations that are not houses of worship. The right to free exercise of religion is a constitutional right protected by the First Amendment. But like all individual rights, it is not unlimited. You cannot take whatever action you want in the name of religion. Further, there is a history of constitutional laws stopping people from doing certain things even though their religions require it. For example, there are laws banning bigamy although some Mormon fundamentalist sects believe plural marriage is a requirement. General laws banning animal cruelty are constitutional, even if some religions practice animal sacrifice. But the Affordable Care Act’s mandate was challenged not because it stops people from doing things required by their religion, but because it forces citizens to actively participate in an action that they believe to be evil, or pay fines. This provision of the ACA has been challenged by numerous individuals and associations, including Catholic universities, professional organizations, and religious communities such as Little Sisters of the Poor (nuns who operate nursing homes for the elderly). “A new government health care mandate says that our family business must provide what I believe are abortion-causing drugs as part of our health insurance. Being Christians, we don't pay for drugs that might cause abortions. Which means that we don't cover emergency contraception, the morning-after pill or the week-after pill. We believe doing so might end a life after the moment of conception, something that is contrary to our most important beliefs. It goes against the biblical principles on which we have run this company since day one. If we refuse to comply, we could face $1.3 million per day in government fines” (David Green, “Christian companies can't bow to sinful mandate,” USA Today, September 12, 2012). In Burwell v. Hobby Lobby (2014), the Supreme Court held that Hobby Lobby and other similar companies could not be forced to provide certain types of birth control to which they object on religious grounds, namely those which they believe cause abortions. The Court held that doing so violates the Religious Freedom Restoration Act. According to Justice Alito, author of the majority opinion, employees of such corporations, similar to employees of non-profit organizations, will be still be able to obtain these types of birth control through the insurance company to which the company is a client. Some see a conflict of rights in this situation. But there is only a conflict of rights if you believe birth control or sterilization paid for by someone else is a “right.” If you do not believe birth control or sterilization paid for by someone else is a right, then there is no conflict. This is why the debate on the nature of rights matters. The same question – “what is a right?” – is at the crux of many modern debates on rights. Is there a right to a state-sanctioned marriage? If so, are laws banning gay marriage unjust? What about bigamy? Is there a right to have children? If so, can governments prevent gay couples from adopting? What about couples who are just friends? Should the government have to provide in-vitro fertilization for those couples who desire it? Should it have to provide in-vitro fertilization to gay couples? If not, can government impose child-limits or force abortions? Is there a right not to be offended? If so, can government ban “hate speech”? Is there a right to good healthcare? If so, how much should certain people be required to pay for the care of others? If so, can government force medical workers to work longer hours if there are not enough doctors to guarantee everyone's access to this right? If so, can government force medical workers to work for free for a certain length of time if there is not enough money to pay their salaries? Is there a right to an excellent education? If so, should the national government impose national standards and corresponding testing? Should government be able to take children away from parents who do not send their children to school? What about those parents who do not attend parent-teacher meetings, or who do not help with homework? In the end, it matters where we believe rights come from. Do they come to us naturally? Or do rights come from government? If they come from government, how much power should government have to enforce those rights by taking property (including the right of conscience, which Madison called “the most sacred property”) away from certain people to give it to certain others? Promote the progress of science and useful arts. Provide for the general welfare.